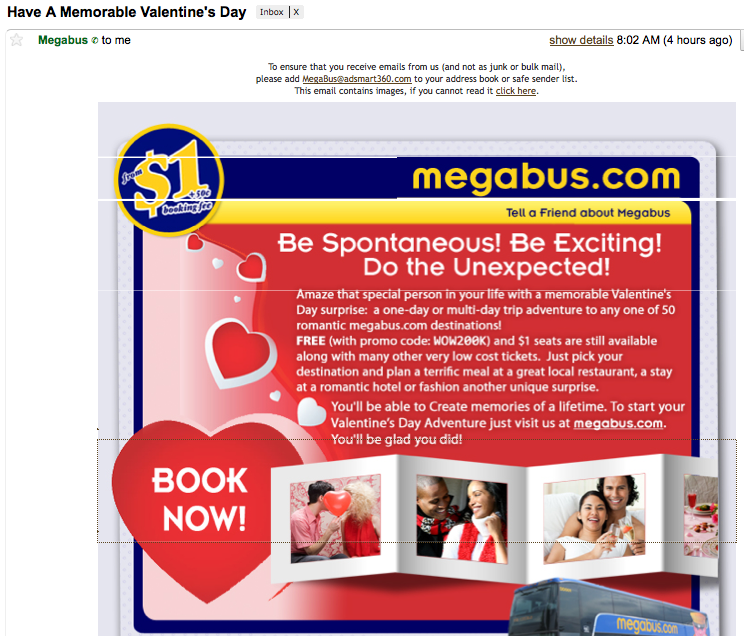 building beyond: What's more romantic than a bus trip? But the extent to which companies will use that ubiquitous V-day holiday as a marketing tool struck me as I was coasting through my inbox and came across Megabus' wish for me to have a "memorable Valentine's Day." This advertisement made me laugh, particularly after I humored them by clicking the link and found that the target was not the expected page full of actually romantic suggestions for a heart-filled adventure for two, but rather their typical website. Blue and yellow without a hint of pink or even red. In the words of Eliza Doolittle: What a fool I was, what a dominated fool. False disappointment aside, the idea of the "romantic getaway" or, more generally, the uplifting effect of the unexpected, is thoroughly entrenched in cultural ideas about love and Valentine's Day in particular. It's full of butterflies, cooing doves, and calls to be "whisked away" from the boredom of reality into new heights of ... well, a whole new world, an escape from the everyday. I confess that I myself enjoy my fair share of adventures with the man friend and can be susceptible to such sentiments, but in the midst of studio deadlines / readings / projects / meetings, then the question comes: what's wrong with the daily? Instead of concentrating so many efforts on a single day - named after a saint who may or may not have even existed and whose connection to eros is tenuous at best - wouldn't it actually be more telling to express the value of the relationship over the course of the year - and beyond? Even #1 is dissatisfying if only as fireworks that fade with the falling of ash. Paper hearts and chocolates get eaten, wrappers crumple and are tossed away, but what endures?